Openers were initially produced simply to turn manual doors into automatic ones. Over time, they began to accumulate various additional features that have made them a great addition to any home. The leading manufacturers in the industry focus on developing more advanced systems, which can further enhance people's safety. LiftMaster, for example, has made a breakthrough with its innovative security features including WiFi control and the Security Plus feature. The latest garage door clicker by Genie is actually a controller that allows remote monitoring of your door. Other great brands, like Craftsman, Marantec, and Sears, offer equally durable models, with varying unique features of their own. There are different opener options you can choose from, but your decision must depend on the specific characteristics of your door. Our professionals can help you make a choice by making sure you take everything from your local climate conditions to the noise output of your new opener into consideration. We also provide emergency garage door repair services, so you can rest assured that if you have us install a new opener at your home and something unexpected goes wrong, we'll be there to fix it. What's common among opener manufacturers is that they all try to produce systems that will enhance the security of your home. Most new models integrate backup batteries into their design, as well as LED indicator lighting, rolling code technology (of course) and a powerful AC or DC motor. When choosing a new model, one of the most important aspects to consider is the horsepower output. Options usually range from ½ to 1 ¾ horsepower, and the amount you need will depend on the characteristics of your door. Its size and weight are the main determinants. Although safety is the number one factor for installing and maintaining your residential garage door opener, our services can come in handy in many different ways. The technicians of our company can take care of the entire system. We'll fix anything from the trolley to the circuit board, and perform sensor alignment and drive lubrication if they are necessary. Our professionals can also adjust the travel limit of your door to keep it from hanging slightly open or slamming to the floor when it closes. If you're having some clicker remote issues, we can help you with those too. 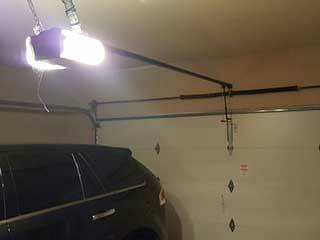 All you need to do is call Garage Door Repair Phoenix today.